Microsoft cloud services deliver hyper-scale services and infrastructure, enterprise-grade capabilities, and many choices for hybrid connectivity. Customers can choose to access these services either via the Internet or with Azure ExpressRoute, which provides private network connectivity. The Microsoft Azure platform allows customers to seamlessly extend their infrastructure into the cloud and build multi-tier architectures. Additionally, third parties can enable enhanced capabilities by offering security services and virtual appliances. This white paper provides an overview of security and architectural issues that customers should consider when using Microsoft cloud services accessed via ExpressRoute. It also covers creating more secure services in Azure virtual networks. 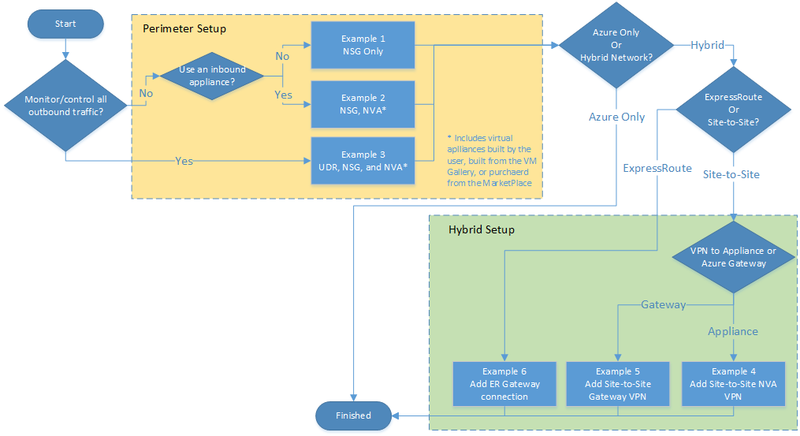 The following logic chart can direct you to a specific example of the many security techniques available with the Azure platform. For quick reference, find the example that best fits your case. For expanded explanations, continue reading through the paper. Example 1: Build a perimeter network (also known as DMZ, demilitarized zone, or screened subnet) to help protect applications with network security groups (NSGs). Example 2: Build a perimeter network to help protect applications with a firewall and NSGs. Example 3: Build a perimeter network to help protect networks with a firewall, user-defined route (UDR), and NSG. Example 4: Add a hybrid connection with a site-to-site, virtual appliance virtual private network (VPN). 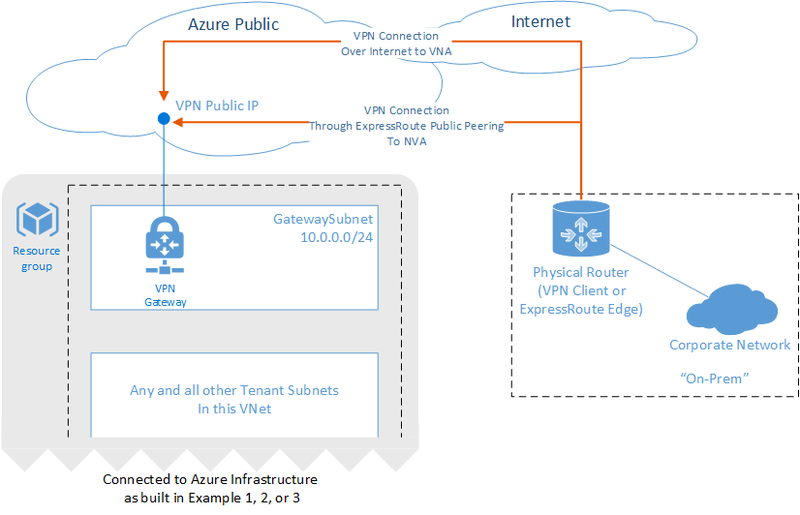 Example 5: Add a hybrid connection with a site-to-site, Azure VPN gateway. Example 6: Add a hybrid connection with ExpressRoute. Examples for adding connections between virtual networks, high availability, and service chaining will be added to this document over the next few months. To help organizations comply with national, regional, and industry-specific requirements governing the collection and use of individuals’ data, Microsoft offers over 40 certifications and attestations. The most comprehensive set of any cloud service provider. For more information, see the compliance information on the Microsoft Trust Center. Microsoft has a comprehensive approach to protect cloud infrastructure needed to run hyper-scale global services. Microsoft cloud infrastructure includes hardware, software, networks, and administrative and operations staff, in addition to the physical data centers. This approach provides a more secure foundation for customers to deploy their services in the Microsoft cloud. The next step is for customers to design and create a security architecture to protect these services. Although Microsoft invests heavily in protecting the cloud infrastructure, customers must also protect their cloud services and resource groups. A multilayered approach to security provides the best defense. A perimeter network security zone protects internal network resources from an untrusted network. A perimeter network refers to the edges or parts of the network that sit between the Internet and the protected enterprise IT infrastructure. In typical enterprise networks, the core infrastructure is heavily fortified at the perimeters, with multiple layers of security devices. The boundary of each layer consists of devices and policy enforcement points. Each layer can include a combination of the following network security devices: firewalls, Denial of Service (DoS) prevention, Intrusion Detection or Protection Systems (IDS/IPS), and VPN devices. Policy enforcement can take the form of firewall policies, access control lists (ACLs), or specific routing. The first line of defense in the network, directly accepting incoming traffic from the Internet, is a combination of these mechanisms to block attacks and harmful traffic while allowing legitimate requests further into the network. This traffic routes directly to resources in the perimeter network. That resource may then “talk” to resources deeper in the network, transiting the next boundary for validation first. The outermost layer is called the perimeter network because this part of the network is exposed to the Internet, usually with some form of protection on both sides. The following figure shows an example of a single subnet perimeter network in a corporate network, with two security boundaries. There are many architectures used to implement a perimeter network. These architectures can range from a simple load balancer to a multiple-subnet perimeter network with varied mechanisms at each boundary to block traffic and protect the deeper layers of the corporate network. How the perimeter network is built depends on the specific needs of the organization and its overall risk tolerance. How can a perimeter network in Azure be built? What are some of the Azure features available to build the perimeter network? How can back-end workloads be protected? How are Internet communications controlled to the workloads in Azure? 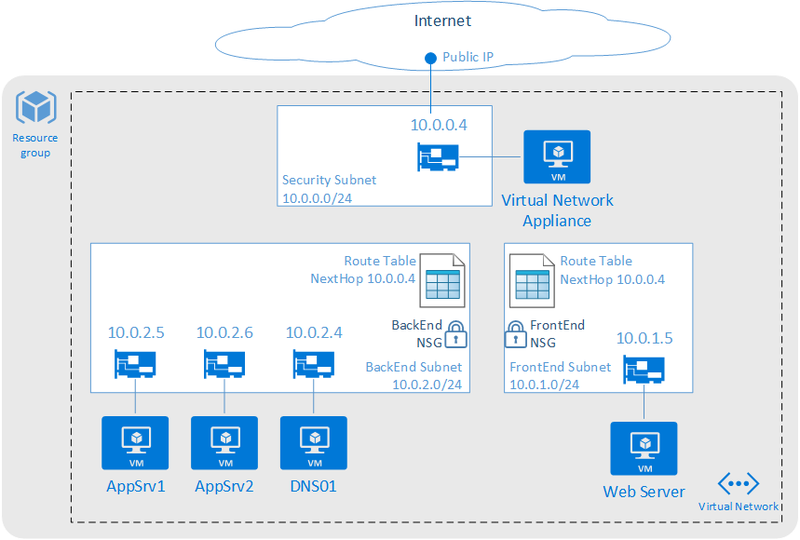 How can the on-premises networks be protected from deployments in Azure? When should native Azure security features be used versus third-party appliances or services? Inbound from the Internet, Azure DDoS helps protect against large-scale attacks against Azure. The next layer is customer-defined public IP addresses (endpoints), which are used to determine which traffic can pass through the cloud service to the virtual network. Native Azure virtual network isolation ensures complete isolation from all other networks and that traffic only flows through user configured paths and methods. These paths and methods are the next layer, where NSGs, UDR, and network virtual appliances can be used to create security boundaries to protect the application deployments in the protected network. The next section provides an overview of Azure virtual networks. These virtual networks are created by customers, and are what their deployed workloads are connected to. Virtual networks are the basis of all the network security features required to establish a perimeter network to protect customer deployments in Azure. DDoS protection: DDoS protection is a layer of the Azure physical network that protects the Azure platform itself from large-scale Internet-based attacks. These attacks use multiple “bot” nodes in an attempt to overwhelm an Internet service. 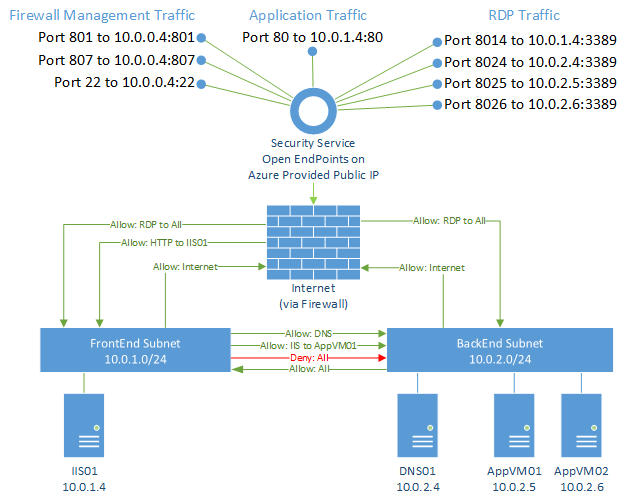 Azure has a robust DDoS protection mesh on all inbound, outbound, and cross-Azure region connectivity. This DDoS protection layer has no user configurable attributes and is not accessible to the customer. The DDoS protection layer protects Azure as a platform from large-scale attacks, it also monitors out-bound traffic and cross-Azure region traffic. Using network virtual appliances on the VNet, additional layers of resilience can be configured by the customer against a smaller scale attack that doesn't trip the platform level protection. An example of DDoS in action; if an internet facing IP address was attacked by a large-scale DDoS attack, Azure would detect the sources of the attacks and scrub the offending traffic before it reached its intended destination. In almost all cases, the attacked endpoint isn't affected by the attack. In the rare cases that an endpoint is affected, no traffic is affected to other endpoints, only the attacked endpoint. Thus other customers and services would see no impact from that attack. It's critical to note that Azure DDoS is only looking for large-scale attacks. It is possible that your specific service could be overwhelmed before the platform level protection thresholds are exceeded. For example, a web site on a single A0 IIS server, could be taken offline by a DDoS attack before Azure platform level DDoS protection registered a threat. Public IP Addresses: Public IP addresses (enabled via service endpoints, Public IP addresses, Application Gateway, and other Azure features that present a public IP address to the internet routed to your resource) allow cloud services or resource groups to have public Internet IP addresses and ports exposed. The endpoint uses Network Address Translation (NAT) to route traffic to the internal address and port on the Azure virtual network. This path is the primary way for external traffic to pass into the virtual network. The Public IP addresses are configurable to determine which traffic is passed in, and how and where it's translated on to the virtual network. Traffic isolation: A virtual network is the traffic isolation boundary on the Azure platform. Virtual machines (VMs) in one virtual network cannot communicate directly to VMs in a different virtual network, even if both virtual networks are created by the same customer. Isolation is a critical property that ensures customer VMs and communication remains private within a virtual network. Traffic isolation refers only to traffic inbound to the virtual network. By default outbound traffic from the VNet to the internet is allowed, but can be prevented if desired by NSGs. Multi-tier topology: Virtual networks allow customers to define multi-tier topology by allocating subnets and designating separate address spaces for different elements or “tiers” of their workloads. These logical groupings and topologies enable customers to define different access policy based on the workload types, and also control traffic flows between the tiers. Cross-premises connectivity: Customers can establish cross-premises connectivity between a virtual network and multiple on-premises sites or other virtual networks in Azure. To construct a connection, customers can use VNet Peering, Azure VPN Gateways, third-party network virtual appliances, or ExpressRoute. 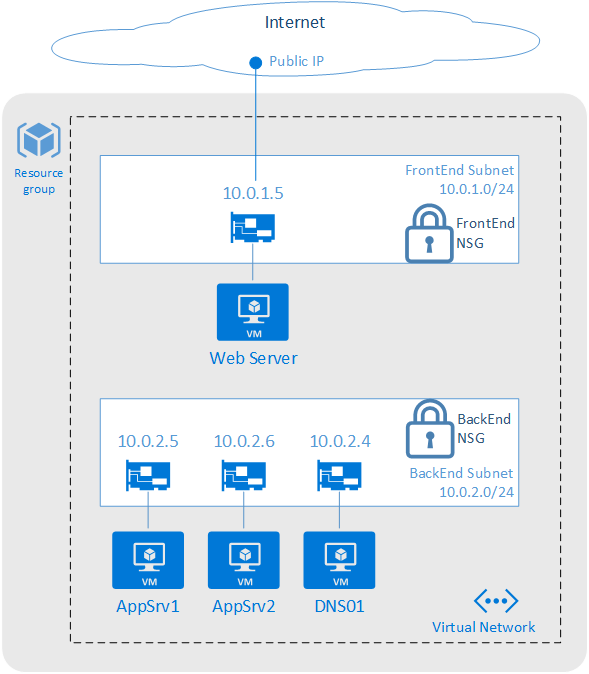 Azure supports site-to-site (S2S) VPNs using standard IPsec/IKE protocols and ExpressRoute private connectivity. NSG allows customers to create rules (ACLs) at the desired level of granularity: network interfaces, individual VMs, or virtual subnets. Customers can control access by permitting or denying communication between the workloads within a virtual network, from systems on customer’s networks via cross-premises connectivity, or direct Internet communication. UDR and IP Forwarding allow customers to define the communication paths between different tiers within a virtual network. Customers can deploy a firewall, IDS/IPS, and other virtual appliances, and route network traffic through these security appliances for security boundary policy enforcement, auditing, and inspection. 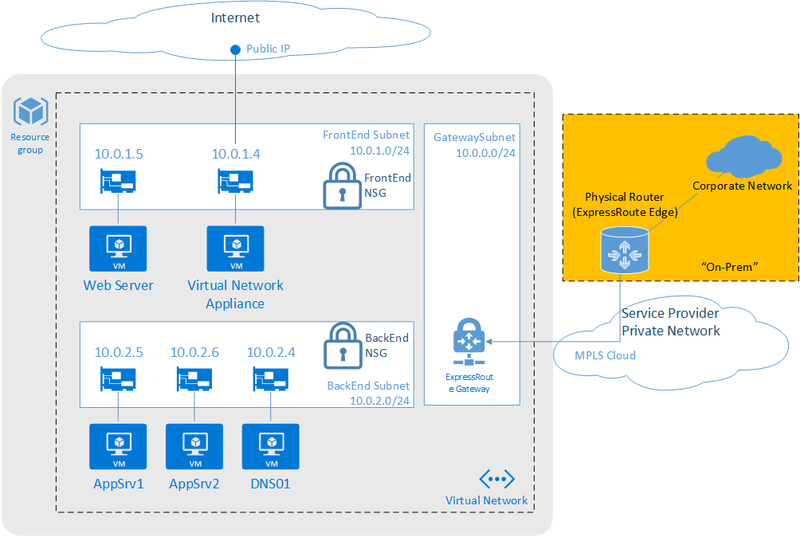 Network virtual appliances in the Azure Marketplace: Security appliances such as firewalls, load balancers, and IDS/IPS are available in the Azure Marketplace and the VM Image Gallery. Customers can deploy these appliances into their virtual networks, and specifically, at their security boundaries (including the perimeter network subnets) to complete a multi-tiered secure network environment. The perimeter network is the front end of the network, directly interfacing communication from the Internet. The incoming packets should flow through the security appliances, such as the firewall, IDS, and IPS, before reaching the back-end servers. Internet-bound packets from the workloads can also flow through the security appliances in the perimeter network for policy enforcement, inspection, and auditing purposes, before leaving the network. Additionally, the perimeter network can host cross-premises VPN gateways between customer virtual networks and on-premises networks. The perimeter network subnet itself is Internet-facing, directly communicating with the Internet. Public IP addresses, VIPs, and/or service endpoints pass Internet traffic to the front-end network and devices. Inbound traffic from the Internet passes through security devices before other resources on the front-end network. If outbound security is enabled, traffic passes through security devices, as the final step, before passing to the Internet. There is no direct path from the Internet to the core infrastructure. Channels to the core infrastructure must traverse through security devices such as NSGs, firewalls, or VPN devices. Other devices must not bridge Internet and the core infrastructure. Security devices on both the Internet-facing and the protected network facing boundaries of the perimeter network (for example, the two firewall icons shown in the previous figure) may actually be a single virtual appliance with differentiated rules or interfaces for each boundary. For example, one physical device, logically separated, handling the load for both boundaries of the perimeter network. Workloads must not store business critical information. Access and updates to perimeter network configurations and deployments are limited to only authorized administrators. Subnet architecture: Specify the virtual network such that an entire subnet is dedicated as the perimeter network, separated from other subnets in the same virtual network. This separation ensures the traffic between the perimeter network and other internal or private subnet tiers flows through a firewall or IDS/IPS virtual appliance. User-defined routes on the boundary subnets are required to forward this traffic to the virtual appliance. NSG: The perimeter network subnet itself should be open to allow communication with the Internet, but that does not mean customers should be bypassing NSGs. Follow common security practices to minimize the network surfaces exposed to the Internet. Lock down the remote address ranges allowed to access the deployments or the specific application protocols and ports that are open. There may be circumstances, however, in which a complete lock-down is not possible. For example, if customers have an external website in Azure, the perimeter network should allow the incoming web requests from any public IP addresses, but should only open the web application ports: TCP on port 80 and/or TCP on port 443. Routing table: The perimeter network subnet itself should be able to communicate to the Internet directly, but should not allow direct communication to and from the back end or on-premises networks without going through a firewall or security appliance. Security appliance configuration: To route and inspect packets between the perimeter network and the rest of the protected networks, the security appliances such as firewall, IDS, and IPS devices may be multi-homed. They may have separate NICs for the perimeter network and the back-end subnets. The NICs in the perimeter network communicate directly to and from the Internet, with the corresponding NSGs and the perimeter network routing table. The NICs connecting to the back-end subnets have more restricted NSGs and routing tables of the corresponding back-end subnets. Firewall: Enforcing firewall rules or access control policies for the incoming requests. Threat detection and prevention: Detecting and mitigating malicious attacks from the Internet. Auditing and logging: Maintaining detailed logs for auditing and analysis. Reverse proxy: Redirecting the incoming requests to the corresponding back-end servers. This redirection involves mapping and translating the destination addresses on the front-end devices, typically firewalls, to the back-end server addresses. Forward proxy: Providing NAT and performing auditing for communication initiated from within the virtual network to the Internet. Router: Forwarding incoming and cross-subnet traffic inside the virtual network. VPN device: Acting as the cross-premises VPN gateways for cross-premises VPN connectivity between customer on-premises networks and Azure virtual networks. VPN server: Accepting VPN clients connecting to Azure virtual networks. Keep the following two groups separate: the individuals authorized to access the perimeter network security gear and the individuals authorized as application development, deployment, or operations administrators. Keeping these groups separate allows for a segregation of duties and prevents a single person from bypassing both applications security and network security controls. In this section, unless specifically mentioned, the term "networks" refers to private Azure virtual networks created by a subscription administrator. The term doesn't refer to the underlying physical networks within Azure. Also, Azure virtual networks are often used to extend traditional on-premises networks. It is possible to incorporate either site-to-site or ExpressRoute hybrid networking solutions with perimeter network architectures. This hybrid link is an important consideration in building network security boundaries. The following three questions are critical to answer when you're building a network with a perimeter network and multiple security boundaries. 1) How many boundaries are needed? A single boundary: One on the front-end perimeter network, between the virtual network and the Internet. 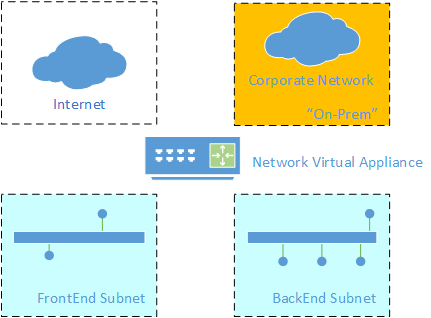 Two boundaries: One on the Internet side of the perimeter network, and another between the perimeter network subnet and the back-end subnets in the Azure virtual networks. Three boundaries: One on the Internet side of the perimeter network, one between the perimeter network and back-end subnets, and one between the back-end subnets and the on-premises network. N boundaries: A variable number. Depending on security requirements, there is no limit to the number of security boundaries that can be applied in a given network. The number and type of boundaries needed vary based on a company’s risk tolerance and the specific scenario being implemented. This decision is often made together with multiple groups within an organization, often including a risk and compliance team, a network and platform team, and an application development team. People with knowledge of security, the data involved, and the technologies being used should have a say in this decision to ensure the appropriate security stance for each implementation. Use the smallest number of boundaries that satisfy the security requirements for a given situation. With more boundaries, operations and troubleshooting can be more difficult, as well as the management overhead involved with managing the multiple boundary policies over time. However, insufficient boundaries increase risk. Finding the balance is critical. The preceding figure shows a high-level view of a three security boundary network. The boundaries are between the perimeter network and the Internet, the Azure front-end and back-end private subnets, and the Azure back-end subnet and the on-premises corporate network. 2) Where are the boundaries located? On purely Azure networks, the options are native Azure features (for example, Azure Load Balancers) or network virtual appliances from the rich partner ecosystem of Azure (for example, Check Point firewalls). If a boundary is needed between Azure and an on-premises network, the security devices can reside on either side of the connection (or both sides). Thus a decision must be made on the location to place security gear. In the previous figure, the Internet-to-perimeter network and the front-to-back-end boundaries are entirely contained within Azure, and must be either native Azure features or network virtual appliances. Security devices on the boundary between Azure (back-end subnet) and the corporate network could be either on the Azure side or the on-premises side, or even a combination of devices on both sides. There can be significant advantages and disadvantages to either option that must be seriously considered. For example, using existing physical security gear on the on-premises network side has the advantage that no new gear is needed. It just needs reconfiguration. The disadvantage, however, is that all traffic must come back from Azure to the on-premises network to be seen by the security gear. Thus Azure-to-Azure traffic could incur significant latency, and affect application performance and user experience, if it was forced back to the on-premises network for security policy enforcement. 3) How are the boundaries implemented? Each security boundary will likely have different capability requirements (for example, IDS and firewall rules on the Internet side of the perimeter network, but only ACLs between the perimeter network and back-end subnet). Deciding on which device (or how many devices) to use depends on the scenario and security requirements. In the following section, examples 1, 2, and 3 discuss some options that could be used. Reviewing the Azure native network features and the devices available in Azure from the partner ecosystem shows the myriad options available to solve virtually any scenario. Another key implementation decision point is how to connect the on-premises network with Azure. Should you use the Azure virtual gateway or a network virtual appliance? These options are discussed in greater detail in the following section (examples 4, 5, and 6). Additionally, traffic between virtual networks within Azure may be needed. These scenarios will be added in the future. Once you know the answers to the previous questions, the Fast Start section can help identify which examples are most appropriate for a given scenario. For scripts and an Azure Resource Manager template, see the detailed build instructions. In this example, an NSG group is built and then loaded with six rules. Generally speaking, you should create your specific “Allow” rules first, followed by the more generic “Deny” rules. The given priority dictates which rules are evaluated first. Once traffic is found to apply to a specific rule, no further rules are evaluated. NSG rules can apply in either the inbound or outbound direction (from the perspective of the subnet). Internal DNS traffic (port 53) is allowed. RDP traffic (port 3389) from the Internet to any Virtual Machine is allowed. HTTP traffic (port 80) from the Internet to web server (IIS01) is allowed. Any traffic (all ports) from IIS01 to AppVM1 is allowed. Any traffic (all ports) from the Internet to the entire virtual network (both subnets) is denied. Any traffic (all ports) from the front-end subnet to the back-end subnet is denied. With these rules bound to each subnet, if an HTTP request was inbound from the Internet to the web server, both rules 3 (allow) and 5 (deny) would apply. But because rule 3 has a higher priority, only it would apply, and rule 5 would not come into play. Thus the HTTP request would be allowed to the web server. If that same traffic was trying to reach the DNS01 server, rule 5 (deny) would be the first to apply, and the traffic would not be allowed to pass to the server. Rule 6 (deny) blocks the front-end subnet from talking to the back-end subnet (except for allowed traffic in rules 1 and 4). This rule-set protects the back-end network in case an attacker compromises the web application on the front end. The attacker would have limited access to the back-end “protected” network (only to resources exposed on the AppVM01 server). There is a default outbound rule that allows traffic out to the Internet. For this example, we’re allowing outbound traffic and not modifying any outbound rules. To lock down traffic in both directions, user-defined routing is required (see example 3). How to build this perimeter network with classic PowerShell scripts. How to build this perimeter network with an Azure Resource Manager template. Detailed descriptions of each NSG command. Detailed traffic flow scenarios, showing how traffic is allowed or denied in each layer. Any Internet traffic (all ports) to the network virtual appliance (firewall) is allowed. With these rules bound to each subnet, if an HTTP request was inbound from the Internet to the firewall, both rules 3 (allow) and 5 (deny) would apply. But because rule 3 has a higher priority, only it would apply, and rule 5 would not come into play. Thus the HTTP request would be allowed to the firewall. If that same traffic was trying to reach the IIS01 server, even though it’s on the front-end subnet, rule 5 (deny) would apply, and the traffic would not be allowed to pass to the server. Rule 6 (deny) blocks the front-end subnet from talking to the back-end subnet (except for allowed traffic in rules 1 and 4). This rule-set protects the back-end network in case an attacker compromises the web application on the front end. The attacker would have limited access to the back-end “protected” network (only to resources exposed on the AppVM01 server). On the firewall, forwarding rules should be created. Since this example only routes Internet traffic in-bound to the firewall and then to the web server, only one forwarding network address translation (NAT) rule is needed. The forwarding rule accepts any inbound source address that hits the firewall trying to reach HTTP (port 80 or 443 for HTTPS). It's sent out of the firewall’s local interface and redirected to the web server with the IP Address of 10.0.1.5. How to build this example with an Azure Resource Manager template. Detailed descriptions of each NSG command and firewall rule. The VNETLocal is always one or more defined address prefixes that make up the virtual network for that specific network (that is, it changes from virtual network to virtual network, depending on how each specific virtual network is defined). The remaining system routes are static and default as indicated in the table. Local subnet traffic with no Next Hop defined to allow local subnet traffic to bypass the firewall. Virtual network traffic with a Next Hop defined as firewall. This next hop overrides the default rule that allows local virtual network traffic to route directly. All remaining traffic (0/0) with a Next Hop defined as the firewall. Not having the local subnet entry in the UDR breaks local subnet communications. In our example, 10.0.1.0/24 pointing to VNETLocal is critical! Without it, packet leaving the Web Server (10.0.1.4) destined to another local server (for example) 10.0.1.25 will fail as they will be sent to the NVA. The NVA will send it to the subnet, and the subnet will resend it to the NVA in an infinite loop. The chances of a routing loop are typically higher on appliances with multiple NICs that are connected to separate subnets, which is often of traditional, on-premises appliances. UDR can now be applied to the gateway subnet on which the ExpressRoute circuit is connected. Examples of how to enable your perimeter network with ExpressRoute or site-to-site networking are shown in examples 3 and 4. IP Forwarding is a companion feature to UDR. IP Forwarding is a setting on a virtual appliance that allows it to receive traffic not specifically addressed to the appliance, and then forward that traffic to its ultimate destination. For example, if AppVM01 makes a request to the DNS01 server, UDR would route this traffic to the firewall. With IP Forwarding enabled, the traffic for the DNS01 destination (10.0.2.4) is accepted by the appliance (10.0.0.4) and then forwarded to its ultimate destination (10.0.2.4). Without IP Forwarding enabled on the firewall, traffic would not be accepted by the appliance even though the route table has the firewall as the next hop. To use a virtual appliance, it’s critical to remember to enable IP Forwarding along with UDR. Any traffic (all ports) from the Internet to the entire virtual network (all subnets) is denied. No Public IP addresses on any FrontEnd or BackEnd NICs. NSGs denying traffic from the Internet. The firewall dropping asymmetric traffic. One interesting point regarding the NSG in this example is that it contains only one rule, which is to deny Internet traffic to the entire virtual network, including the Security subnet. However, since the NSG is only bound to the front-end and back-end subnets, the rule isn’t processed on traffic inbound to the Security subnet. As a result, traffic flows to the Security subnet. Based on the Network Virtual Appliance used, the management ports vary. In this example, a Barracuda NextGen Firewall is referenced, which uses ports 22, 801, and 807. Consult the appliance vendor documentation to find the exact ports used for management of the device being used. In the preceding logical diagram, the security subnet is not shown because the firewall is the only resource on that subnet. The diagram is showing the firewall rules and how they logically allow or deny traffic flows, not the actual routed path. Also, the external ports selected for the RDP traffic are higher ranged ports (8014 – 8026) and were selected to loosely align with the last two octets of the local IP address for easier readability (for example, local server address 10.0.1.4 is associated with external port 8014). Any higher non-conflicting ports, however, could be used. Firewall management rule: This App Redirect rule allows traffic to pass to the management ports of the network virtual appliance. RDP rules (for each Windows server): These four rules (one for each server) allow management of the individual servers via RDP. The four RDP rules could also be collapsed into one rule, depending on the capabilities of the network virtual appliance being used. Application traffic rules: There are two of these rules, the first for the front-end web traffic, and the second for the back-end traffic (for example, web server to data tier). The configuration of these rules depends on the network architecture (where your servers are placed) and traffic flows (which direction the traffic flows, and which ports are used). The first rule allows the actual application traffic to reach the application server. While the other rules allow for security and management, application traffic rules are what allow external users or services to access the applications. For this example, there is a single web server on port 80. Thus a single firewall application rule redirects inbound traffic to the external IP, to the web servers internal IP address. The redirected traffic session would be translated via NAT to the internal server. The second rule is the back-end rule to allow the web server to talk to the AppVM01 server (but not AppVM02) via any port. Outbound to Internet rule: This rule allows traffic from any network to pass to the selected networks. This rule is usually a default rule already on the firewall, but in a disabled state. This rule should be enabled for this example. DNS rule: This rule allows only DNS (port 53) traffic to pass to the DNS server. For this environment, most traffic from the front end to the back end is blocked. This rule specifically allows DNS from any local subnet. Subnet to subnet rule: This rule is to allow any server on the back-end subnet to connect to any server on the front-end subnet (but not the reverse). Deny all traffic rule: This deny rule should always be the final rule (in terms of priority), and as such if a traffic flow fails to match any of the preceding rules it is dropped by this rule. This rule is a default rule and usually in-place and active. No modifications are usually needed to this rule. On the second application traffic rule, to simplify this example, any port is allowed. In a real scenario, the most specific port and address ranges should be used to reduce the attack surface of this rule. Once the previous rules are created, it’s important to review the priority of each rule to ensure traffic is allowed or denied as desired. For this example, the rules are in priority order. How to build this example perimeter network with classic PowerShell scripts. Detailed descriptions of each UDR, NSG command, and firewall rule. Hybrid networking using a network virtual appliance (NVA) can be added to any of the perimeter network types described in examples 1, 2, or 3. As shown in the previous figure, a VPN connection over the Internet (site-to-site) is used to connect an on-premises network to an Azure virtual network via an NVA. If you use ExpressRoute with the Azure Public Peering option enabled, a static route should be created. This static route should route to the NVA VPN IP address out your corporate Internet and not via the ExpressRoute connection. The NAT required on the ExpressRoute Azure Public Peering option can break the VPN session. Once the VPN is in place, the NVA becomes the central hub for all networks and subnets. The firewall forwarding rules determine which traffic flows are allowed, are translated via NAT, are redirected, or are dropped (even for traffic flows between the on-premises network and Azure). Traffic flows should be considered carefully, as they can be optimized or degraded by this design pattern, depending on the specific use case. The on-premises router, or any other network device that is compatible with your NVA for VPN, would be the VPN client. This physical device would be responsible for initiating and maintaining the VPN connection with your NVA. How to build this example perimeter network with PowerShell scripts. Detailed traffic flow scenarios, showing how traffic flows through this design. 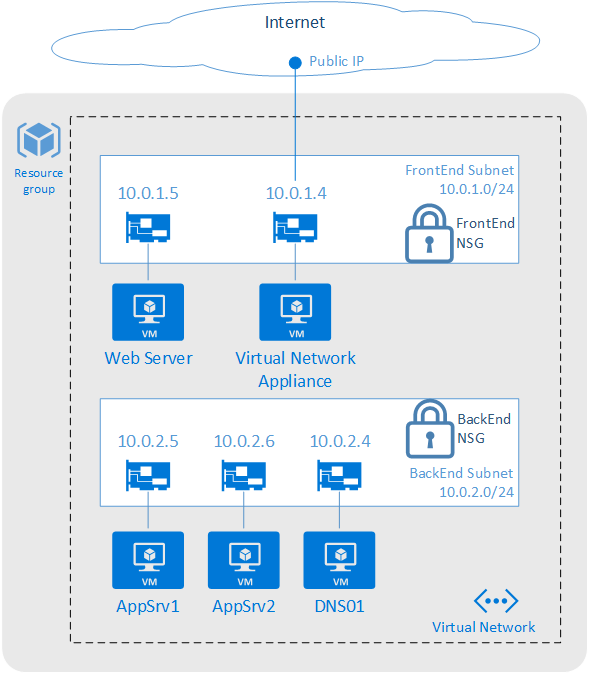 Hybrid networking using an Azure VPN gateway can be added to either perimeter network type described in examples 1 or 2. 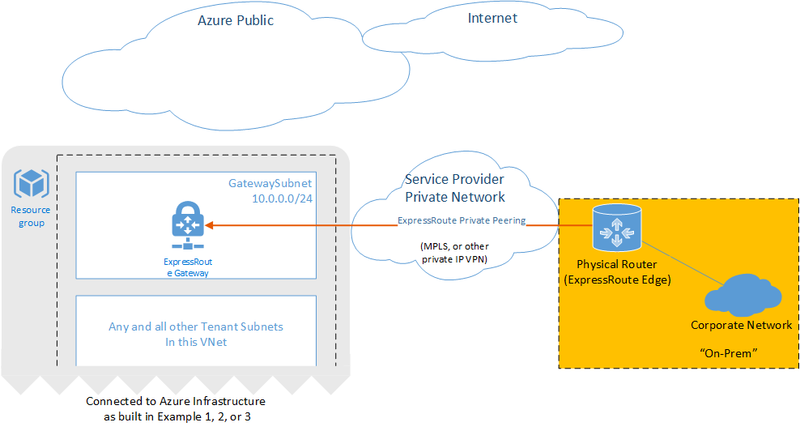 As shown in the preceding figure, a VPN connection over the Internet (site-to-site) is used to connect an on-premises network to an Azure virtual network via an Azure VPN gateway. If you use ExpressRoute with the Azure Public Peering option enabled, a static route should be created. This static route should route to the NVA VPN IP address out your corporate Internet and not via the ExpressRoute WAN. The NAT required on the ExpressRoute Azure Public Peering option can break the VPN session. The following figure shows the two network edges in this example. On the first edge, the NVA and NSGs control traffic flows for intra-Azure networks and between Azure and the Internet. 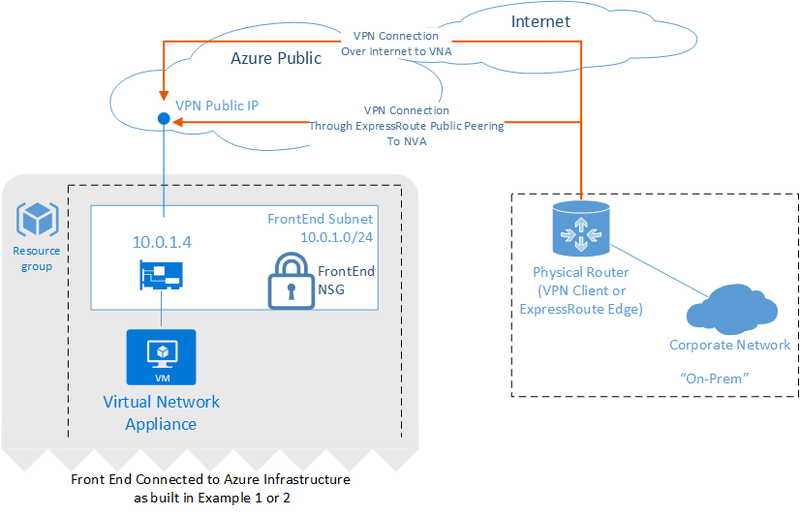 The second edge is the Azure VPN gateway, which is a separate and isolated network edge between on-premises and Azure. Hybrid networking using an ExpressRoute private peering connection can be added to either perimeter network type described in examples 1 or 2. 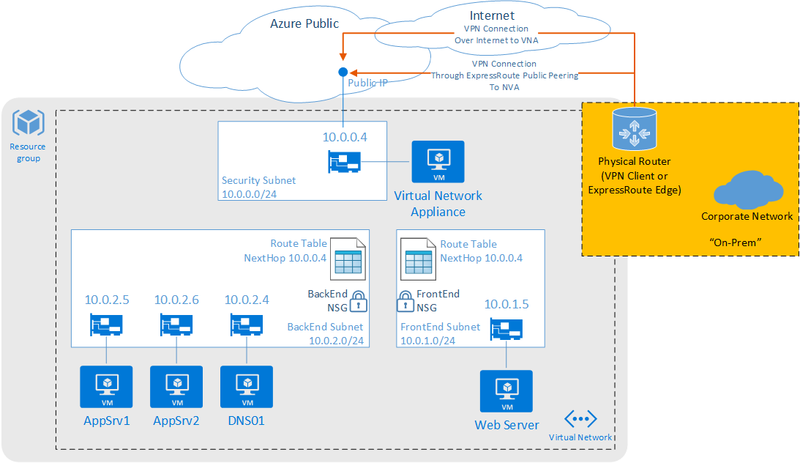 As shown in the preceding figure, ExpressRoute private peering provides a direct connection between your on-premises network and the Azure virtual network. Traffic transits only the service provider network and the Microsoft Azure network, never touching the Internet. Using ExpressRoute keeps corporate network traffic off the Internet. It also allows for service level agreements from your ExpressRoute provider. The Azure Gateway can pass up to 10 Gbps with ExpressRoute, whereas with site-to-site VPNs, the Azure Gateway maximum throughput is 200 Mbps. As seen in the following diagram, with this option the environment now has two network edges. The NVA and NSG control traffic flows for intra-Azure networks and between Azure and the Internet, while the gateway is a separate and isolated network edge between on-premises and Azure.